We are providing a wide range of Optical Power Meter which are appreciated by our clients owing to their accuracy in performance and consistency in output. 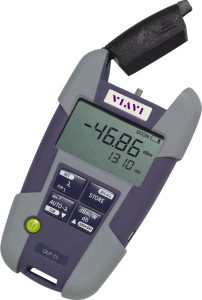 These Optical Power Meter are procured by our expert procuring agents from trusted vendors. 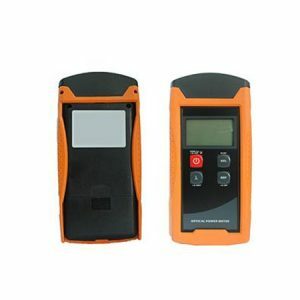 It is a new generation handheld optical network tester.It stays LT500’s design small dimension for easy carrying but have new features for wider power measurement, higher accuracy and long battery life and have clock display on the screen.It is calibrated at a large number of wavelengths to enable power measurements to be made on a wide range of Single Mode and Multimode fibre optic cable systems. The wavelength is simply selected by wavelength button key.By transmitting light at a known power level at one end of a fibre using a laser source, and measuring the power at the other end with the Optical Power Meter, the Attenuation (loss) of the cable can be determined.By calibrating the source, with the meter connected directly, zeroing the meter and then inserting the cable, the cable loss can be measured directly.The new Optical Power Meter is a tester that enables field technicians or laboratory personnel to measure power and loss in optical links.Its InGaAs detector has exceptional accuracy, combined with an incredibly simple user interface.